Monday, October 19, regular rehearsals at our Westgate Studios. The timing of a recent Hilldale atrium remodel coupled with the ever-expanding size of our ensembles has left us without enough space to comfortably host this beloved annual public event. We are already thinking about and considering many options for a public event/venue for next year that can accommodate (and celebrate!) our growing membership. We have removed this event from ensemble calendars--thank you for making a note of it. Hallowe'en is just around the corner which means businesses are already planning their holiday decorations. It's time to begin selling poinsettias! Our annual plant sale begins today with order forms available on our website and linked below. We will also have a small supply at the rehearsal table this weekend. Our poinsettias are supplied by Felly's Greenhouse and are guaranteed. They are beautiful plants that last well beyond the holidays. We sell three colors--pink, white, and red in four sizes ranging in price from $11-$36. Families earn $5 per plant sold, regardless of size, toward their fundraising goal. Plants are available until our stock is sold out but our initial deadline for submitting orders is November 9 so Felly's has time to prepare the orders. Please read through the information sheet before you begin selling and please contact the MYC office with any questions you may have. MYC retains sales information from past years and will gladly pass along former singer leads to interested families. If you sold to businesses last year and need your contact information, please let us know--we can easily provide past order information to make your pitch as simple as possible. Ragazzi tux fittings will begin this Sunday, October 18, from 4-4:45pm (before your 5pm rehearsal).These are drop-in fittings for new singers and for returning singers who have outgrown their wardrobe or moved on to Ragazzi from Holst. Please lend a hand and make our day! We need a lot of immediate help organizing the boychoir wardrobe pieces and will welcome fitting help as well. Click the button below to volunteer! October coffee orders will be ready for pick up in the MYC office on Friday, October 16 or at rehearsals this weekend. November orders will be due Thursday, November 5. The application deadline is tomorrow October 16, 2015. Please visit Madison Opera for the application and more information. 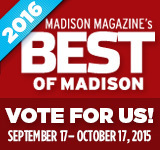 Voting continues through October 17. Find us under Arts and Entertainment tucked into the Youth Performing Arts section. Thank you!